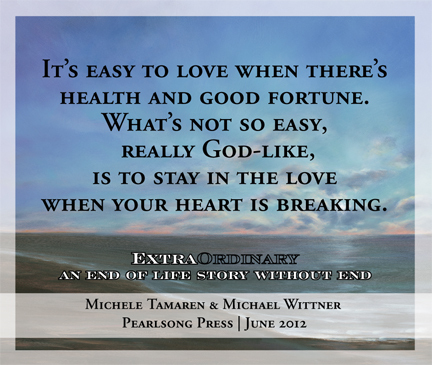 ExtraOrdinary: An End of Life Story Without End is a spiritual memoir and love story about a man who became a healer and a teacher in his mid-nineties as his own life was coming to completion. Herman Liss, an Orthodox Jew. was described by a Christian mystic with the Buddhist term bodhisattva—a person who returns to this life to help lift others on their soul journey. It is said that great sages often come in the form of ordinary people. Herman Liss, Michele Tamaren's stepfather, was such a man. ExtraOrdinary tells of the love between Herman and his wife that continued after her passing. It shares the love between an elder and a young volunteer eighty years his junior and between a father and his adult daughter. It also explores how a hospice patient, through his compassion and his wisdom, helped heal those who cared for him. 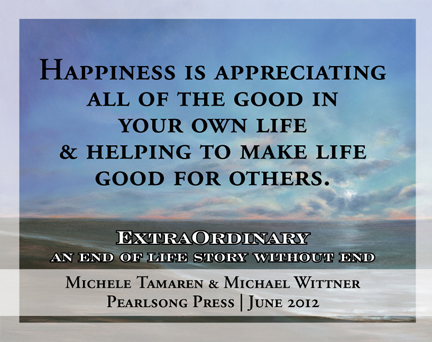 ExtraOrdinary is written in two voices: that of Michele, Herman's daughter not by blood but by blessing, and that of Herman's young volunteer, Michael, who created an award-winning film about the sacred passage from loss and despair to connection and joy. Herman taught by example how to love, how to listen, how to forgive, and how to be grateful for each day. ExtraOrdinary is a story of growth and learning, a joining of generations and cultures and hearts. 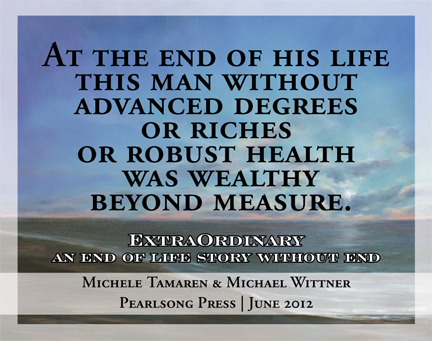 "In this deeply moving and inspiring account, Tamaren and Wittner share the life story of a man close to their hearts. When Michele’s mother, Betty, married Herman Liss (she was 55 and he was 65), Tamaren finally had a father figure she adored. Always joyful, Herman exuded a love for life that was contagious. His sincere concern for others, his keen intelligence, and his natural grace generated hundreds of meaningful friendship throughout his life. Wittner, who first met Herman as a result of a community service requirement in his high school, became a devoted friend to the older man when Herman nearly lost the resolve to live after Betty’s death. The authors recall, in simple but evocative language, how Herman always encouraged others to follow their dreams and how deep was his commitment to treat others as he would want to be treated. Readers can expect tears to flow as Herman’s life inspires them to be better." "ExtraOrdinary invites us to explore that which is true and enduring, even beyond our last breath. The spiritual memoir of Herman and Betty Liss, knit with grace and skill, humor and compassion, bridges generations and cultures and faiths. It cuts through darkness and despair with a laser-sharp beam of hope and healing, dancing us into our own hearts, making love real." "This is a true-life tale of transformation. In the pages of ExtraOrdinary you will enter into a sacred space where illusory divisions dissolve and the lines between this world and the next are thin. Through tears and laughter you will marvel at the love shared in a nursing home that became a house of healing for one special resident and all those he touched." "A beautifully written story about the incomparable Herman Liss, told by the daughter who adored him for 30 years and the young boy who knew him for only one. Through their words they shine a brilliant light on a remarkable man whom every reader will wish they, too, could have met. I only wish I had this book in my hands as I was caring for my own mother." The Onassis Women & Where's Whitey? "In a world where our Western elders have forfeited their own wisdom, here is a book that calls them back, that tells them the road is possible. Even greater, it denies nothing of their struggle, but uses that as the way and the giver of blessing." "A must read! 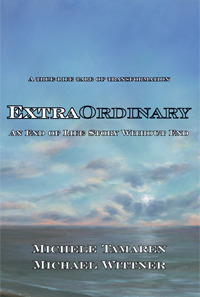 ExtraOrdinary: An End of Life Story Without End is at once unique and universal. 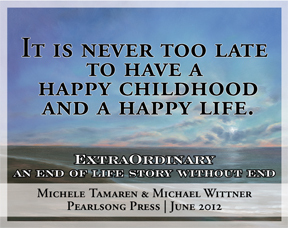 With brilliance and depth, Michele Tamaren and Michael Wittner write of love, loss and the enduring human spirit. This is a book that enters your heart and touches your soul." 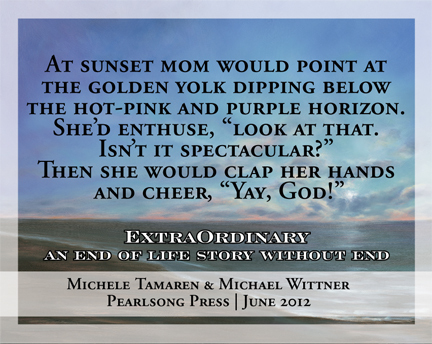 "ExtraOrdinary is a page-turner! Although I never met Herman Liss, I feel I now know him and am inspired by his modesty, goodness, and ability to delight in life, even at its most difficult. Written with clarity and insight, this book is itself a delight."